Those of us in the business of aesthetics and rejuvenation are always on the lookout for high-quality, scientifically proven advances to help us give our patients the best options and care available. You never know what groundbreaking, revolutionary cosmetic procedure or product could appear on the horizon and completely change the way that we’re able to deliver our services. Just a few years ago, it was CoolSculpting – turning the way we look at body sculpting completely upside down, with its patented cold energy technology that targets only fat cells and none of the surrounding tissue. That said, there is often no substitute for the tried and true. Never is that truer than with Alpha Hydroxy Acids, or AHAs for short; we’ve had these tools at our fingertips for years, and their efficacy is simply unparalleled in terms of exfoliating the skin. These acids are naturally occurring substances that in day-to-day life are usually found in fermented sugars, like in fruit, sour milk or sugar cane. But science has proven that the most useful AHA is a remarkable substance called glycolic acid. Glycolic acid is special, even among the other AHAs. 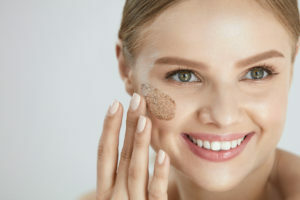 This is because it has the smallest molecule of all of these acids, which allows it to be absorbed by your skin much easier than the others, delivering some remarkable results. Not only can it help clear out your pores and improve your overall skin texture, but glycolic acid also has tremendous anti-aging benefits, stimulating new collagen growth as well as helping to even out your skin tone. It really is a remarkable beauty innovation! That’s why we have introduced it here at Azul. If you want to learn more about how glycolic acid helps in our treatments and products, just read on. The HydraFacialMD is one of the most popular facials in the world, including with many Hollywood celebrities. It’s certainly a favorite here at Azul. So many of our patients make an initial appointment for one, only to find out how beautiful their skin can look and feel, and they leave purchasing a package of three or four treatments. There are four parts to the HydraFacial MD: Cleaning and Exfoliation, Chemical Peel, Extractions, and Moisturizing. In this case, we’re going to take a look at the “Chemical Peel” part of the HydraFacial MD. Traditionally, many people think of chemical peels as burning and painful procedures. I mean, we’re almost all willing to endure a little temporary discomfort or irritation for the sake of beauty, but even the most intrepid of us may sometimes flinch at the words “chemical peel.” And yes, there was a time when a chemical peel (especially a badly administered one) could result in a great deal of skin irritation and pain. But gone now are the days when a strong acid was used to burn off the top layer of skin. Thanks to the arrival of AHAs, especially glycolic acid, that’s a thing of the past. The glycolic acid chemical peel that’s one step of the HydraFacial is especially gentle on the skin, leaving you glowing (rather than peeling, with irritated, red, painful skin!) At most, a glycolic acid chemical peel can feel like gentle tingling on the skin. That’s one of the major advantages of glycolic acid. It can deliver results that are similar to, or even better than, the chemical peels of yesterday, but without any of the associated irritation! With the discovery of AHAs, many companies started to put them into their skincare products, without really knowing what they were contributing, or how to go about it. This was always a pet peeve of Dr. Flaharty’s. He would see dozens of products on drugstore shelves promising magical, unrealistic results, all claiming to be thanks to glycolic acid. So, teaming up with his wife, Dr. Kristen Flaharty, they founded Trilogy Laboratories, a dedicated skincare product company that creates every item in the Azul SkinHealth Line. At Trilogy Laboratories, they use cutting-edge aesthetic science – testing and proving every ingredient, every amount, every result – to create effective, authentic products that actually do what they say they do! And that includes our Exfoliation Lotions with glycolic acid. Coming in two strengths, 5% and 10%, our Exfoliation Lotion can deliver results similar to what you might get with the HydraFacialMD’s chemical peel. It’s the ultimate in anti-aging exfoliating lotions. Made with professional-strength glycolic acid, this product also boosts collagen and elastin production, using bio-engineered copper complex proteins. We recommend starting with the Glycolic Acid 5%, and then slowly working your way up to the Glycolic Acid 10%. If you have particularly sensitive skin, be sure to use it sparingly to avoid irritation. AHAs are certainly much more gentle than other acids, but they can still pack a punch. Our AHA Salt Scrub is the best shower scrub you may ever use. It utilizes lactic and glycolic acids, along with Dead Sea salts, to help soften and exfoliate the skin. Other ingredients, like jojoba, squalane and sunflower oils, help moisturize the skin, while vitamin E gives our scrub excellent antioxidant properties. The application is easy. You put it on your wet skin and let it sit there for about 10 minutes. Then simply wash it off. You may find yourself saying “A-ha!” the minute you see your incredible results! Both Rejuva Cream and Rejuva Gel include an active anti-aging cleanser that contains 10% glycolic acid. This will not only remove any debris and dead skin built up on your face, it will also help to improve the absorption of any serums and moisturizers you use afterward. If you have oily skin, you will probably want to use the gel formulation, while if you have dry or mature skin, the cream version might be best for you. These procedures and products are just the start of the revolution that AHAs, and glycolic acid specifically, are bringing to the skincare and aesthetics industry. Trilogy Laboratories will be continuing to experiment with AHAs to find new and better ways that they can be used to enhance your beauty regimen. In the meantime, if you want to give glycolic acid a try to see the incredible results you can get, I suggest that you schedule yourself for a HydraFacialMD! You can also look over our Azul SkinHealth products at our Medical Spa, or simply order them online at www.azulskinhealth.com. If you’d like to book a free consultation with our professional estheticians to learn how AHAs can completely shift your anti-aging routine for the better, please give us a call at (239) 747-1148. To learn more about all of the treatments at our Medical Spa, as well as the surgical and non-surgical procedures we offer, please visit our website at www.azulbeauty.com for more information.